The world of gaming is ever changing, and it’s amazing to see how smartphones and tablets have left their respective imprints on this market. As an iOS enthusiast, it’s great news to hear that the first episode of Batman – The Telltale Series is now available for free following a recent update. Titled “Realm of Shadows,” episode one deals with Bruce Wayne’s (voiced by Troy Baker) realization that his father was actually a ruthless crime boss. Such a discovery leads Wayne to question his own role in Gotham City as the Caped Crusader. Harvey Dent (Travis Willingham), Vicki Vale (Erin Yvette), Lieutenant James Gordon (Murphy Guyver) and Selina Kyle/Catwoman (Laura Bailey) are among the featured characters in the series. For physical media enthusiasts, Batman – The Telltale Series is also available as a season pass disc for Xbox One, Xbox 360, PlayStation 4 and PlayStation 3. Are you a fan of Telltale Games’ series of episodic gaming? Leave us a comment below and offer up your thoughts on Batman – The Telltale Series! If you’re tired of flat level roads that simply wind and curve their way to the its final destination, the free-to-play title Vertigo Racing might be up your alley. 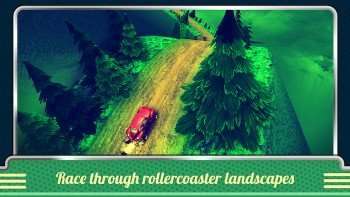 The Chillingo title, now available on the App Store and Google Play, has gamers speeding through mountainous regions with ’50s automobiles. While getting the chance to drive up to 10 vintage cars, players will attempt to survive as long as possible while also traveling through dangerous glaciers and ancient walls. Drifting is also a method of crossing the finish line, and giving these vehicles an entirely new paint job is also in the offing. Created by Romanian based developer Deep Byte Studios, the title’s free to play mechanic is great for gamers who don’t want to initially pay for their mobile or tablet entertainment, and hopefully this title has a ton of good will gameplay before any sort of freemium mechanic sets in. We have yet to download Vertigo Racing on our iOS devices, but if you play the game please tell us what you think and comment below! Marvel Avengers Academy, a just released free to play title available on the App Store and Google Play, has gamers tasked with building and running the Avengers Academy. Under this setting, players will encounter super heroes and villains when they were students developing their superpowers. Through combat training and performing various student centered missions (attending classes, taking part in sports teams, and going on dates), the characters’ various abilities will be upgraded. 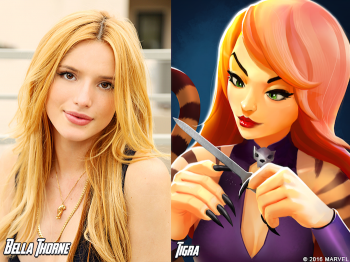 One of the game’s biggest draws lies in the talented voice cast that take part in Marvel Avengers Academy. Some of the actors featured in the title include Bella Thorne (Tigra), Kiernan Shipka (Spider-Woman), John Cena (Hulk), Colton Haynes (Thor), Alison Brie (Black Widow), Alexandra Daddario (Wasp), Dave Franco (Iron Man), and Priyanka Chopra (Ms. Marvel). For more info on Marvel Avengers Academy, check out its official Facebook page. Actor Patton Oswalt will provide his voice for Minecraft: Story Mode – A Telltale Games Series, a collaboration between Mojang and Telltale Games. The five-part, episodic game series is set in the Minecraft universe brings new characters to the equation. The narrative centers on Jesse (Oswalt) who, along with his friends, revere the legendary Order of the Stone. These four adventures (Warrior, Redstone Engineer, Griefer, Architect) were famed for slaying an Ender Dragon. The worlds of fantasy and reality mesh at EnderCon, as Jesse and his buddies embark on a journey to find the Order of the Stone in an attempt to save their world from destruction. Along with Oswalt, Brian Posehn, Ashley Johnson, Scott Porter, Martha Plimpton, Corey Feldman, Billy West, Dave Fennoy, and Paul Reubens are among the actors that will lend their voices to the series. 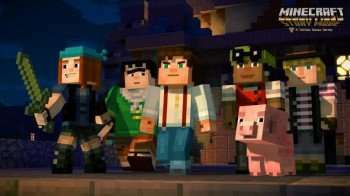 Minecraft: Story Mode – A Telltale Game Series is currently in development and will be available for download later this year on PC, PlayStation 4, PlayStation 3, Xbox One, Xbox 360, and iOS and Android devices. For up to date info, please follow @TelltaleGames and @Minecraft on Twitter. 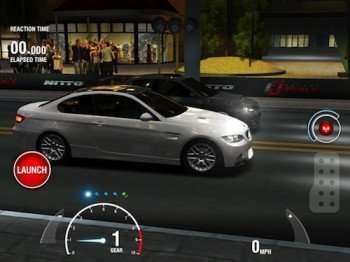 The first things to know about Racing Rivals is that its graphics are a complete sight to behold. Although I prefer to play all my apps on an iPad, mobile users can also receive a total thrill from this title due to its simplified control mechanic. 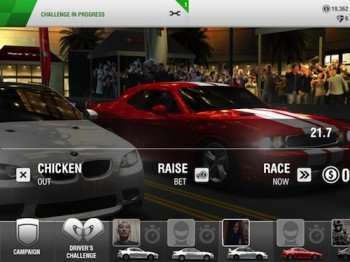 It’s also a free to play title, and even if you’re not a big fan of the freemium model, Racing Rivals has a ton of races to offer sans making any kind of dent to your pocketbook. All you need is a wi-fi connection to race various competitors all around the world, and you can either utilize your own vehicles in these challenges or race the same car in during certain matchups. The main challenge in controlling your car is knowing exactly when to shift during the race, and the command is located on the lower right hand side of your device (it’s the icon with the “+” sign). The launch button, located on the left side, is also an important element to your race, as getting the right jump against your adversary will usually win you the race, especially if you’ve got your shifting skills down pat. If you want to hold your tablet and maneuver your car around different locales and feel the crunch of smashing into other vehicles, Racing Rivals won’t fulfill your needs. It’s a drag racing game whose backbone rests on its excellent multiplayer aspect. I’ve played the app numerous times and haven’t had any lag time in finding a competitor. Of course, I’ve lost almost all my matches, but that’s a criticism of my own skills and not the app’s competence. With the game’s on-point visuals another positive aspect to Racing Rivals, I’ve also spent my share of time in the garage. I recently purchased this white BMW, which ironically has less wins than my blue Honda Civic (you will use in game currency as well as gems to purchase your cars as well as upgrade and repair your rides). Even if my BMW is a total loser, at least it looks really pretty in the shop. Gems are earned during your races, and if you don’t want to use your own cash to buy gem or cash bundles, just make sure you win your respective showdowns (which I consistently fail to do, fyi). 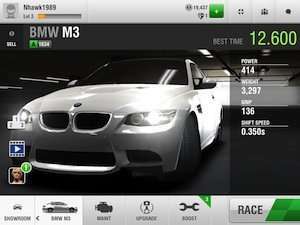 Racing Rivals (Cie Games, Rated 4+, 49.7 MB) is available on iPhone & iPad. Oil Rush is a naval strategy game that traversed the PC waters before landing on iOS shores. Actually there really are no shores in Oil Rush’s post apocalyptic world, as dry land is merely a pipe dream. This is a slick future we live in, where capturing refineries is a businessman’s main trade and our waters is now as black as night. For a $4.99 price tag, this app is broadening its tower defense based horizons, and whether it succeeds depends on how far you want to swim. My initial foray into Oil Rush was far from an audacious one, as I avoided its campaign mode and tried my hand at a quick game. 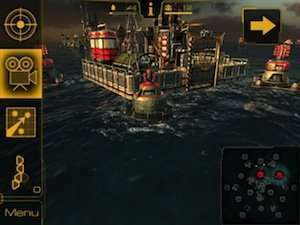 Although there are enough instructions to give a rudimentary feel for the adventure, playing in campaign mode is a much more intensive and informative experience. Since it’s a mixture of a real time strategy and tower defense experience, you’ll need first rate multi-tasking skills to succeed. 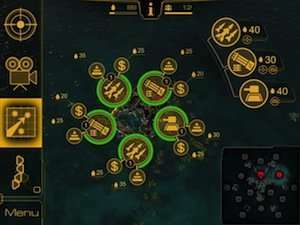 Within several minutes, you’ll probably need to send a few of your troops to take over a refinery as well as build and then upgrade weapons to fortify your own base. If you spend too much time occupying a certain section of your map, your own position or army may be compromised. Amidst all these activities, you also have a cinematic icon on the left hand side of your device which gives you an array of viewing options. Do you want an up close and personal look at your base, or do you want to see your riders drive into enemy territory? Within the first hour of playing, I was on complete sensory overload. Here’s a view of one of my home base, which eventually was overtaken due to lack of protection. Capturing oil stations increases your currency which in turn will be used to building your weapons systems. Missiles, tanks, machine guns are all at your disposal for a price, and as you gain experience in warfare and weapons building, you’ll also earn research points to increase your overall skill points. With more research, you can build strong towers, weapons, and even radar systems to detect your enemies in a more sufficient manner. Strategy is employed by accessing your map, and dragging a finger to your destination sets up your respective moves. Press on the percentage buttons on the right hand side to determine how many soldiers you’re sending to the specified location. Although my red crew is headed for a double team tactic on an enemy owned refinery (marked in yellow), my decision making is suspect, especially since a few invaders (marked in green) are headed my way. I also love Oil Rush’s epic visual scope, as you can zoom in an out of an image and with the use of two fingers a 360 degree view of your surroundings is also available. Whether or not you fully master Oil Rush, it’s hard to deny it’s an app filled with pretty pictures. 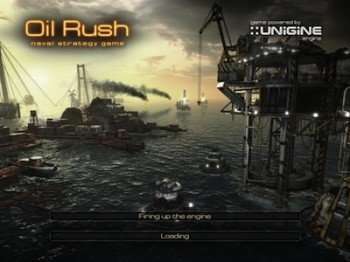 Oil Rush (Rating 12+, 210 MB), developed by Unigine, is available on iPhone & iPad.